North Country Slate has been servicing the Maryland market for over 20 years. 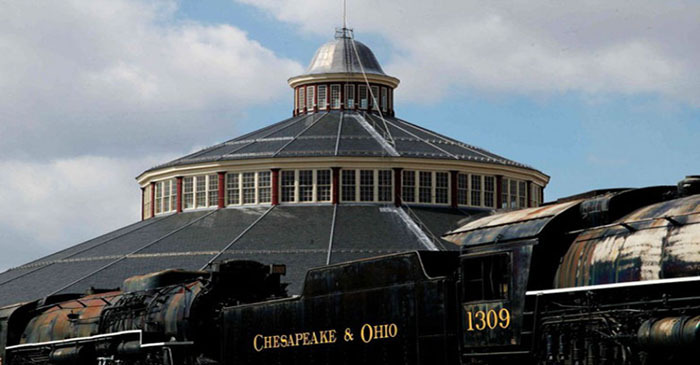 One of our more notable slate roof projects was the restoration of the B&O Museum in Baltimore. The Roundhouse was built in 1884 for $100,471.97. This massive circular structure is 245 feet in diameter, 135 feet high, 46,000 square feet and takes up almost 1 acre. Designed by architect, Ephraim Francis Balwin, the Roundhouse was originally built as a passenger car shop and later became the B&O Museum. Recognized as the birthplace of American railroading, some of the oldest railroad artifacts make up the collection. On February 16, 2003, a major snow storm dumped 28 inches of snow in Baltimore. The roof collapsed as a result of the weight of drifting snow which was nearly six feet in depth. Within a day, the entire roof caved in destroying important historic locomotives. The rebuilding of the Roundhouse began immediately. Care was taken when selecting slate to match the museum’s original high-quality Pennsylvania peach-bottom. Built on a 6:12 slope, 550 squares of our North Country Unfading Black slate, 22” x 10” and 22” x 14” x ¼” was supplied for this project. As the slate roofing supplier for this project, North Country Slate received a Heritage Preservation Award in recognition of the restoration of the Baltimore & Ohio railroad museum roundhouse which was presented by the Board of Directors of Baltimore Heritage, Inc.